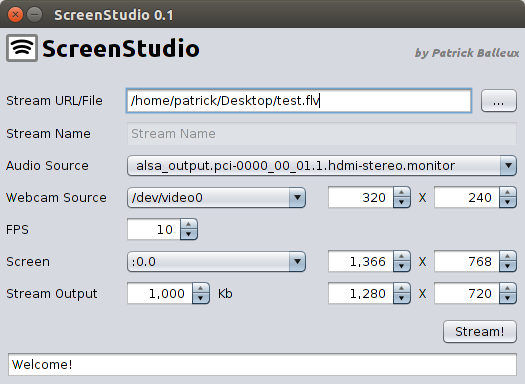 Again, I released a new version of ScreenStudio which does solve audio/video sync issues. Basically, I was struggling with my webcam that was freezing after a while. I finally found the perfect configuration to mix the desktop, the webcam and the banner so the recording can be smooth even on an old laptop like mine. I usually capture at 10fps, to leave some CPU power for other apps, but I did some tests at 15fps and it was still running great. Seems that using a local file in FLV or AVI format, does provide a great encoding performance. Increase the bitrate for maximum quality. If your computer is powerful, cranck the capture rate at 30fps. Have a look at my latest screencast and see how it has improved. I am already working on the 0.9 version where I did some improvement like displaying the real name of the audio and webcam sources instead of showing the file device. Another fix was added when you did not select a custom banner which was preventing saving the last settings. 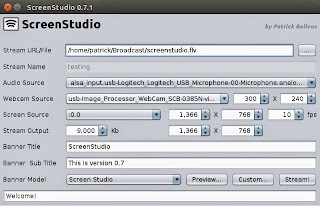 ScreenStudio 0.9 will be released in the next few days. As you may have seen lately, I've started a new project called ScreenStudio. The main purpose of ScreenStudio is to let your broadcast or record your screen in full HD, with your webcam in overlay and a banner. While investigating some hidden features, I realized that a new project was emerging from my brain: ScreenStudio! ScreenStudio is capturing your desktop with your webcam overlayed and is able to broadcast to any RTMP server (Youtube Live, Ustream, Twitch...). If you don't want to broadcast, you can record locally into a file. 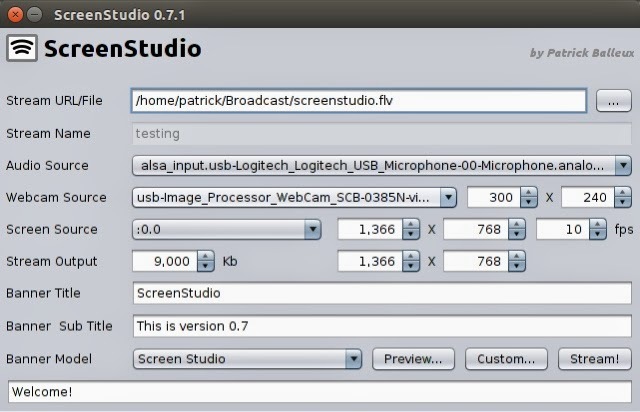 ScreenStudio is not WebcamStudio. It lacks all the "live" features, but does it does one thing very well: Broadcast your desktop! Windows XP is dead... Your computer is not fast enough for Windows 8? Why not try out Ubuntu 14.04! Have a tour of a great free OS!